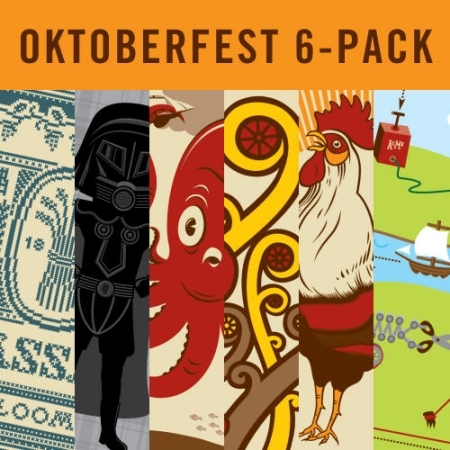 VANKLEEK HILL, ON – Beau’s All Natural Brewing has announced the release the Oktoberfest 6-Pack, a limited edition mixed pack containing 600 ml bottles of six beers made especially for Vankleek Hill Oktoberfest 2012 which took place in late September. Based on a long-lost brewing recipe from the Hudson Valley in the early 1800s, we used New York State malts and whole leaf Cluster hops (a heritage variety) to authentically recreate this heirloom ale. Our Schwarz is bigger than your Schwarz… and tastier too! This extra-strong version of a German black lager displays pronounced roasted flavours juxtaposed with a lager’s enjoyable crispness. Koru Belgian Pale Ale boasts interesting spicy, peppery yeast notes, with tropical fruit inflections from New Zealand Nelson-Sauvin and Rakau hops. Complex and tasty, with a dry finish. A white beer brewed with additions of oats, honey, and molasses. “Zins Jo Kokot!” is a cry that celebrates a local tradition in Cottbus, Brandenburg, where the Kotbusser style originates. An unfiltered beer brewed with sea salt, coriander and a hint of subtle acidity post fermentation. Aromas of citrus, and slight tartness to taste leads into a curiously salty mouth-feel. The Beau’s Oktoberfest 6-Pack is available now at the Beau’s retail store and via the brewery’s BYBO delivery service, retailing for $36 per pack. The beers are also available individually, selling for $7.85 per bottle, or $31.40 per 4-pack.